The Portland Trail Blazers have offered point guard Andre Miller a three-year contract with a team option for a third year, a source close to the process said Friday. The contract would be worth $21 million, with $14 million guaranteed and $7 million included as a team option, the source said. Miller had been balking at signing the 76ers' one-year offer, and the Blazers were one of only two teams with the money to give him more than the mid-level exception. The Trail Blazers have agreed to sign point guard Andre Miller to a multi-year contract, according to the player's agent. "We're closing in on a deal, we should have one shortly,'' agent Andy Miller told The Oregonian shortly before noon. 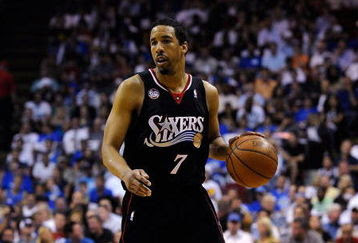 Andre Miller's agent, Andy Miller, has confirmed that within 24 hours Andre Miller will be a Portland Trailblazer. Andy Miller said the two parties are "finalizing" the deal today and it should become official within 24 hours. His client, who has been the 76ers starting point guard for the last 2-1/2 seasons, will receive a deal that one source said was "an improvement" over the deal the Sixers were offering, which was reportedly in the 1-year/$6 million range. The Portland Trail Blazers have broken through in free agency, agreeing on Friday to a multi-year deal with free agent point guard Andre Miller, formerly of the Philadelphia 76ers, according to a source. The Blazers already had been twice spurned in their attempts to land a high-profile guard this summer. The Blazers have been looking to upgrade at point guard but didn't get very far in talks with Dallas guard Jason Kidd (who re-signed with the Mavericks) or Phoenix's Steve Nash (who agreed to a two-year, $22 million extension with the Suns on Monday). Trail Blazers general manager Kevin Pritchard cautioned that “nothing is done yet.” But a source close to Miller said he has decided to take the offer and will sign with the Blazers. Miller will give the Trail Blazers a veteran point guard to help steady their young roster.